Subglacial ecosystems at glacial beds contain considerable amounts of organic matter overridden during periods of ice advance. They are vulnerable to the ongoing climate change, and large amounts of subglacial sediment are exposed annually by glacier retreat and flushed by melt water, with potential impacts on regional carbon fluxes. Our projects aim to quantify microbe-mediated organic carbon transformation processes in the rapidly changing subglacial ecosystems and to facilitate prediction of the future change in the regional carbon stores and flows associated with deglaciation by identifying environmental controls of these processes. We collect samples from glacial systems of different age and size and perform laboratory experiments and analyses to quantify carbon cycling process under the ice and to assess how the melting of glaciers affects regional carbon flows through mobilising subglacial carbon stores and promoting microbial activity. This research has been supported by the Czech Science Foundation grants “The bright future of subglacial ecosystems: Impacts of deglaciation on microbial activity and carbon cycling at glacier beds”(15-17346Y; 2015-2017) and “Microbial methane oxidation in subglacial ecosystems: An unknown methane sink under glaciers and ice sheets” (18-12630S; 2018-2020). Examples of research output of this project can be found here & here & here & here & here. Leverett Glacier river portal, SW Greenland. 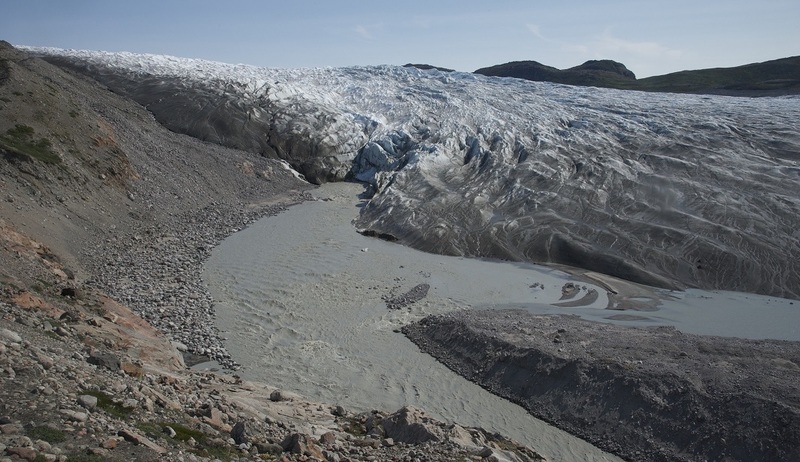 The river is exporting large amounts of subglacial sediment from deep under the ice sheet.